Where to modern zombies come from? Vampires! And it is all because of this book. Richard Matheson was a budding science fiction writer when he decided to give the old vampire a bit of a modern makeover, but without the sparkles. 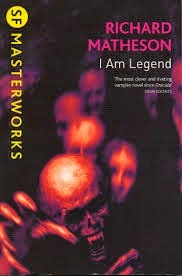 In 1953 Matheson published the novel I am Legend. It is a vampire book set in a post apocalyptic Los Angeles during the late seventies. Considered by some to be the most influential horror book of the twentieth century, I Am Legend has inspired great writers like Stephen King and Ray Bradbury. Who cares, I hear you say. I've seen the movie. Which one? There have been three official movie adaptions and they all take liberties with the original storyline - (I will be reviewing the movies soon). In the novel Robert Neville is apparently the only survivor of a bacterial plague that infects the human population. Those that die come back from the dead as vampires and throw rocks at Robert's home every night. Robert fights back with science, but mainly with garlic and lots of wooden stakes. An old vampire bat bite gives Robert his immunity to the disease which killed his wife and daughter. Now Robert must come to grips with his new environment as the last man alive. The novel builds to a climax as Robert realises there are still infected humans around. Alive but carrying the disease that can kill them. They are creating a new world order and the three worlds of vampires, infected humans and Robert collide. I won't tell you the ending. If you haven't read the book go grab a copy. Despite being over 60 years old it is still a thrilling read. I particularly loved how, with just one sentence at the end of a chapter, Richard Matheson could leave you shocked and wanting more. So how do these vampires become zombies. Well that is another story involving a budding film producer who based his low budget horror movie on I Am Legend.